Naomi and Ely, two 18 year-old college students, are best friends. They have been for ever and they live next door to each other in a Manhattan Apartment Building. Ely has two mothers but one of them temporarily forgot she was a lesbian and had an affair with Naomi’s father. It’s over now and whilst Ely’s mothers are painfully trying to patch their relationship up, Naomi’s father walked out of the family home leaving her weepy mother to take to drugs and her bed permanently. Ely is openly gay. In theory anyway as he has still not acted on it yet, but nevertheless he’s very happy with his sexuality. Naomi however isn’t, happy that is about her best friend being gay even though she tells Ely she is. She’s actually quite the spoilt brat and is used to always getting her own way, and she thinks she still will. Even with Ely. They are determined to stay best friends for ever and so to make sure that no potential suitors should ever ruin this for them, they draw up a list of men that they agree that neither should ever kiss. It includes the new hunky doorman, but it doesn’t include Bruce who has been sort of dating Naomi for a month now, even though they have yet to get to first base. The trouble is that one night Bruce goes way way beyond that, but with Ely instead. This development doesn’t go down at all with Naomi who has a few temper tantrums. She behaves very childishly ensuring that she finishes with her ‘boyfriend’ and her best friend in one fell swoop, all at the same time she also has to be the adult at home instead of her mother and get a job to pay the rent before they get evicted. This lightweight fluffy movie, the second one directed by Kristin Hanggi, is based on the popular novel written by David Levitan and Rachel Cohn, but the end result is not in the same league as the much superior movie made from their ‘Nick & Norah’s Infinite Playlist’. 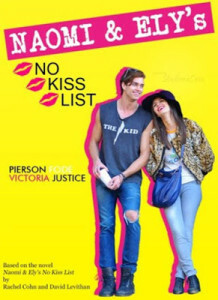 The two lead actors Victoria Justice and Pierson Fode do very well with their parts but I’m sure even they would have prefered their characters to be more than one dimensional. It’s a sappy movie about 18 year-olds for 18 year-old girls who think they can turn gay men straight, or for anyone else who thinks that the most important thing in life really could just be a red glittery belt after all.